Nestlé UK recently announced the launch of a Honeycomb Toffee Crisp for a limited period, and by chance I just so happened to spot them on the same day in a local Premier store. They're currently on offer of 2 for £1 alongside regular Toffee Crisps. The bar weighs 38g which doesn't seem a lot - I'm not sure how much a regular Toffee Crisp weighs these days but it seems pretty light to me. The description reads "Toffee (18%), honeycomb pieces (4%) and crisped cereal (6%) filled milk chocolate". Biting into a piece gave a nice crunch of golden honeycomb, offset by the chewy caramel and crispy rice bits. It all tasted very sweet and sickly, but very crunchy and delicious! The texture of the honeycomb made it a lot crunchier than a regular Toffee Crisp which made for a nice change and it felt quite satisfying, despite the small size of the bar. Price: 2 for £1 at Premier Stores. Allergy Information: Contains Wheat, Dairy. Nutrition (per bar): 197 Calories, 10.5g Fat, 24.1g Carbs. Have you tried Toffee Crisp Honeycomb? If so what did you think? I'm definitely interested to try one of these! When I first read about it though I hoped that maybe the honeycomb would be incorporated in a flavour element rather than actual pieces. A caramel honeycomb flavoured style chocolate would have been interesting! I can't remember the last time I bought a Toffee Crisp but I'd try that coconut version if they brought it back! Honeycomb doesn't appeal to me at all but it's always good to see new flavours. They're so hard to get here in Belfast. However I managed to track one down today and it was very worth the wait. I really enjoyed it, so tasty! Just a shame they're not more readily available. The honeycomb is quite rich but so so good! When I was growing up there were always two Toffee Crisps, one with a red wrapper and one with a blue, milk and plain. I would love for Nestle to bring back the dark chocolate version! 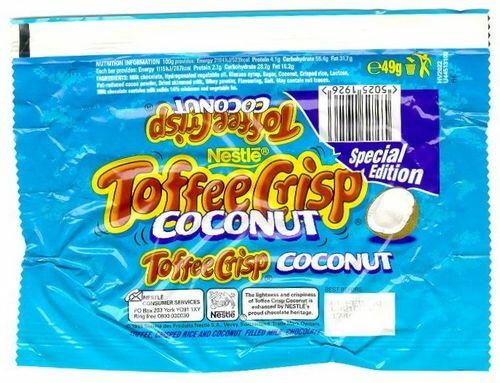 Bring back the coconut toffee crisp!! Coconut toffee crisps were immenses!!! I'm trying to hunt them down, pregnant with twins and craving them badly!!! Anybody know where I can get them?